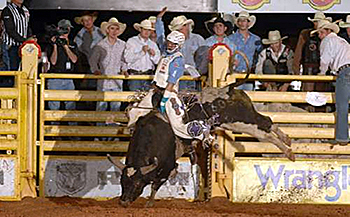 LOVINGTON, N.M. – Some of the greatest athletes in bull riding will converge on southeastern New Mexico in early August. Some of the world’s top cowboys will try to ride them for one of the most coveted titles in the sport during the Lea County Xtreme Bulls, set for 7:30 p.m. Tuesday, Aug. 6, at Jake McClure Arena. This is the second year the bull riding tour has made Lovington one of the biggest stops of the season, and the bull power and big-money purse are key reasons why the top bull riders in the game will come to town. That’s why world champions and others from ProRodeo’s elite will take any means possible to be in Lovington for the event. The list of entrants reads like a who’s who of bull riding, from reigning world champion Cody Teel to 2011 champ Shane Proctor to three-time titlist J.W. Harris. Of the 60 bulls that are scheduled to be part of the festivities, many of them bucked at the Wrangler National Finals Rodeo this past December. Having top-notch stock is one drawing card for cowboys, but the money is another. A year ago, during the inaugural Lea County Xtreme Bulls, veteran Kanin Asay won the title and nearly $8,000. He went on to win the Xtreme Bulls Tour year-end championship and qualified for the NFR for fifth time in his career, finishing the season seventh in the world standings with nearly $130,000. It was just another reflection of why the Lovington event is so valuable to the contestants. “I think it’s good for Lovington because not only will it help their numbers in bull riding contestants, but it will really help their crowd grow for the Xtreme Bulls and the rodeo, too,” Whitney said. When it comes together right, it’s a win-win for everyone – from the contestants to the fair board to the fans who flock to Jake McClure Arena to witness the incredible action.